Slava is an old man. On the verge of death, he has only two regrets; not perfecting his Martial Arts that had been passed down by his Master, and leaving his adopted daughter, as well as disciple, the Elf Alma, alone. His two dying wishes that he makes to her are that she take the hidden scroll of the school and learn its secrets, and that she would love, have a family, and be happy in his stead. But Slava is reborn as an Elf, and with the same first name too! Being told that he was named after the only master of “Alma-sama”, it appears that some time had passed and his adopted daughter had become a very important person! It is a pretty funny story, and the MC is able to interact with two people from his past life because they are still alive in his new life. The MC wants to become the strongest martial artists, and now that he is grown, he will go on a journey. 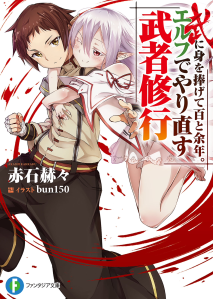 A really good novel about reincarnating in the same world and meeting his old nemesis and disciple in the future, if only the translator would commit himself to translating more. This is the best martial arts novel that I have ever read. Not only are the fight scenes interesting to read, but so are the character interactions. Unfortunately, this novel appears to have been dropped. EDIT: Somebody picked it up, ~yay! Good novel. I quite like the fact that it's focused on pure martial arts. It's refreshing. Fun story, guy lives his life only for martial arts and raises an elf female disciple/adopted daughter for 60 years and dies of old age, no wife and no kids (in the description). Feeling regret he is reborn only to find his adopted daughter/disciple still alive. As of chapter 17 no harem yet. Entertaining read. 4/5 stars as it is a VERY slow story. So it’s a story about a human Martial Artist who is at the end of his life. He leaves his heritage (Martial Arts School) to his adopted daughter (an elf) and ends up reincarnating into the same world a couple years later with his memory intact. Meaning we have an MC who trains his Shijima style from early on and runs into his formerly adopted daughter who now tries to make him the successor to the Shijima style. The story has potential, not much in the sense of world-building or character... more>> development yet, but there have so far only been 11 translated chapters, so I can’t really say much about it. The translation is good, even though it’s quite slow (every 22.7 days according to NU). Each chapter takes about 10 minutes to read (not the first 2).